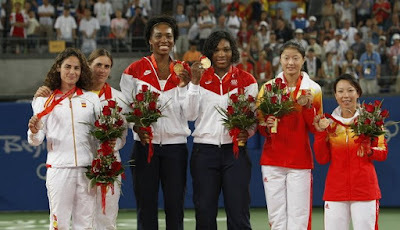 Silver medallists Anabel Garrigues (2nd L) and Virginia Ruando Pascual (L) of Spain, gold medallists Venus Williams (3rd L) and Serena Williams (3rd R) of the US and bronze medallists Yan Zi (2nd R) and Jie Zheng (R) of China pose on the podium at the awards ceremony following the women's doubles tennis final during the 2008 Beijing Olympic Games yesterday. 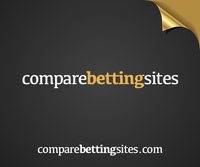 Venus and Serena Williams play together in the Olympic women's doubles and walk away with the gold medal. The famous American sisters overpowered Anabel Medina Garrigues and Virginia Ruano Pascual of Spain 6-2, 6-0 in an 1 hour 6 minutes match. “I’m so excited, I can’t even speak,” said the 28-year-old Venus, who has already won seven doubles Grand Slam titles and a gold medal in Sydney alongside younger sister Serena. The pair didn’t enter the doubles competition in Athens four years ago because Serena was injured at the time. It doesn’t hurt when your sister is one of the best in the world. “I don’t know anyone out there who would get tired of playing with Venus Williams,” said the 26-year-old Serena, who as a singles player is ranked eighth in the world, three spots behind No. 5 Venus. When the red carpet was rolled out on center court, the sisters climbed the medal podium together holding hands. A beaming Venus bobbed her head to the beat as “The Star-Spangled Banner” was played. Both Venus and Serena were beaten in the quarterfinals of the women's singles. The bronze medal went to China's Yan Zi and Zheng Jie who delivered the host country’s only tennis medal by beating Alona and Kateryna Bondarenko of Ukraine 6-2, 6-2.